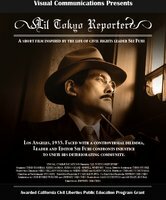 Lil Tokyo Reporter is a narrative film about Sei Fujii, founder of Kashu Mainichi. The world premiere will be held at Laemmle Playhouse 7 Theatre from September 14th to 16th. $9 at the door. "Our narrative film tells an untold story of Sei Fujii, an Issei newpaperman, who defended the Japanese of Los Angeles against unjust laws and unethical business practices from the Great Depression through Internment; the man who overturned the Alien Land Law in 1952 and laid the groundwork for Redress and the future Civil Rights Leaders of today." Please check out the Little Tokyo Historical Society's Film Project page. Also, Lil Tokyo Reporter Official Website. lthistory . Last modified Sep 06 2012 12:29 p.m.